Saddlebags are the infamous nickname for fat that deposits on the outside of thighs. Women are the overwhelming majority of people that develop this unwanted excess fat, making women lose their hourglass shape and develop a more pear shaped, bottom heavy appearance. This can create discomfort in everyday life because constricting jeans or other wardrobe items. Genes play a role in where fat develops throughout the body, and if those in your family tree have that bottom heavy appearance, you may be susceptible because of active fat storage enzymes in your thighs. If exercise and dieting haven’t worked for you, Dr. Rokhsar has several options for removing fat from this unsightly area. For those that are surgery averse, non-invasive lasers such as Liposonix and UltraShape can use their ultrasound waves to destroy fat cells through the skin. 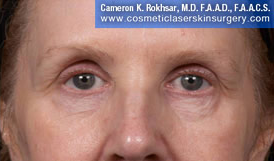 This requires no downtime and results are continually and progressively seen post procedure. CoolSculpting by Zeltiq uses a cooling method called cryolipolysis to target, freeze and break down fat cells in the body. When affected, the fat separates and dies just below the skin and then suspends inside the body and naturally digested. Within weeks full results are achieved without the need for surgery. After the cells are crystallized through a gentle cooling process, the fat progressively decreases with gradual results appearing with three weeks to final results within four months. Zerona is another non-invasive option that liquefies fat by targeting cells and breaking them down just below the skin’s surface. The body then naturally disposes them as dead cells and results are progressively seen after the non-invasive procedure. Desired results are usually seen after six to ten sessions that are ideally spaced every other day or no more than 72 hours in between them in order to prevent fat reuptake. Dr. Rokhsar is the first physician in the United States to use the FDA approved Liposonix procedure, and has since then perfected the technique through extensive patient care. For those wishing to see faster or more dramatic results, patients can opt for Liposuction or Liposculpture. An invasive procedure that developed in 1985 by a dermatologic surgeon is not an answer to obesity, but can greatly reduce stubborn fat deposits along the body, without damaging the skin quality and elasticity. Liposction and Lipsoculpture are essentially terms to describe the same medical procedure. An invasive fat reduction surgery that suctions fat through small tubes inserted into incisions over the area of fat. A pump then slowly and gently removes the fat from the area. You will be able to return to work two to three days after the procedure.